School is in session for the majority of people; it doesn't matter if you are schooling at home, unschooling or something in between. We are all trying to get our children to learn and there is no better way than a field trip! How do you incorporate learning into your field trips? What I mean is do you have your children do any thing special like write a report, keep a journal, make a book or read books about what they have seen before or after the field trip. You may just let your kids explore the place and just soak it all in. There is no right or wrong way, just different ways. I am looking forward to seeing how others manage field trips and record them for their school. 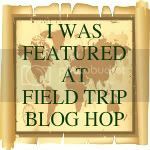 So if you can too, share how you manage your children's field trips and record their educational value! 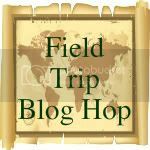 If you would like to know how we manage recording our field trips go to Life's Adventure (my main blog site) and read what I do to assist my kids in retaining information from a field trip! I am looking forward to clicking through everyone's field trips this month. Thanks so much for hosting it. I have the children draw pictures since they are so young. They seem to enjoy this very much! I am looking forward to clicking over to your other blog and gathering up suggestions. Thank You. I was sent here by Chestnut Grove Academy. Looking forward to seeing where everyone else is visiting and getting more ideas for field trips. Thanks for joining in Loved your scrap booking pages on your fire trip field trip!! !